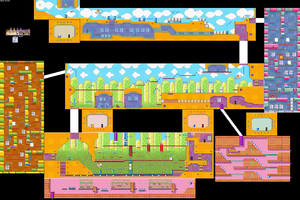 Doodle Woods is the third level of the Topaz Passage in the Game Boy Advance game Wario Land 4. It is the only level in the game to feature Hoggus, an untouchable enemy that draws pictures of Dendens and Butatabis, which will come to life from Hoggus's notebook and become enemies that will hurt Wario upon contact. The name of the Doodle Woods comes from its drawing-styled appearance. There are many drawing-based objects inside this level, including pencils and erasers which act as platforms. Despite the stage's name, it is devoid of trees, which are generally the most prominent feature of wooded areas. This level's CD is called Avocado Song and once collected, it can be played in the Sound Room. The time given to escape the level after hitting the Frog Switch varies between game modes. : the time given is 6:00.
: the time given is 5:15. (unlockable): the time given is 4:00. This page was last edited on April 12, 2019, at 23:51.